Born and brought up in Karamea, Dulcie McNabb wrote a history of the area, and is involved in developing the local tourist industry. Her book was first published in 1974 to mark the centennial of the district, and was republished in 2007. In Karamea terms, I’m a local, with mixed Shetland, Scottish, English and Irish ancestry. My mother’s people came to Karamea with the original ‘special settlers’ in 1874, while my father’s people arrived in Nelson as early as 1843. The menfolk made their way to Karamea from Sandy Bay in 1882 via the Mt Arthur tableland and down the Karamea River, returning home along the Heaphy coastline to collect their families. 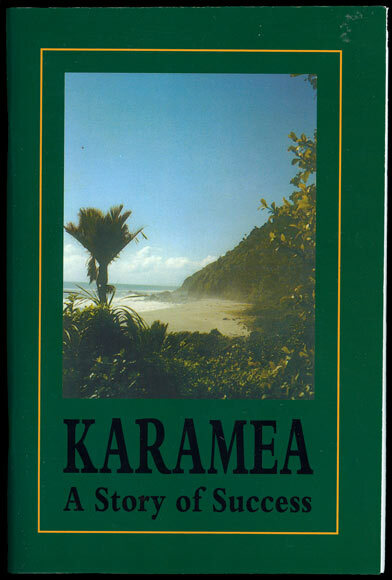 Karamea’s early settlers had little but the pluck and determination to make better lives for themselves, albeit on the other side of the world and in an area of extreme physical and geographic isolation. Typical of remote pioneering communities in New Zealand in the 1800s, Karamea’s early settlers were tough and feisty, and soon developed qualities of self-reliance, independence and courage, making full use of the natural resources of land and timber to ensure the survival of the community, despite its remoteness. Dairying has always been the mainstay of Karamea’s economic development, with horticultural enterprises and tourism slowly filling the void left by the cessation of logging. Today Karamea is one of the gateways to Kahurangi National Park, but as a child growing up in Karamea with a farming background, what is now Kahurangi was our playground. A lifelong enthusiasm for the outdoors, and a sound knowledge of the back-country tracks and facilities – drawn from a family love of hunting and fishing – is now something I can share with our growing numbers of visitors, together with a passion for local and family history. To me Karamea means supportive friends and family, a relaxed lifestyle where material possessions are unimportant, great gardening weather, miles of deserted beaches and stunning walking tracks – a special community where everyone is welcomed with a friendly wave. And don’t forget the spectacular sunsets! For me, Karamea will always be home, and anyway, who wants to live anywhere else!